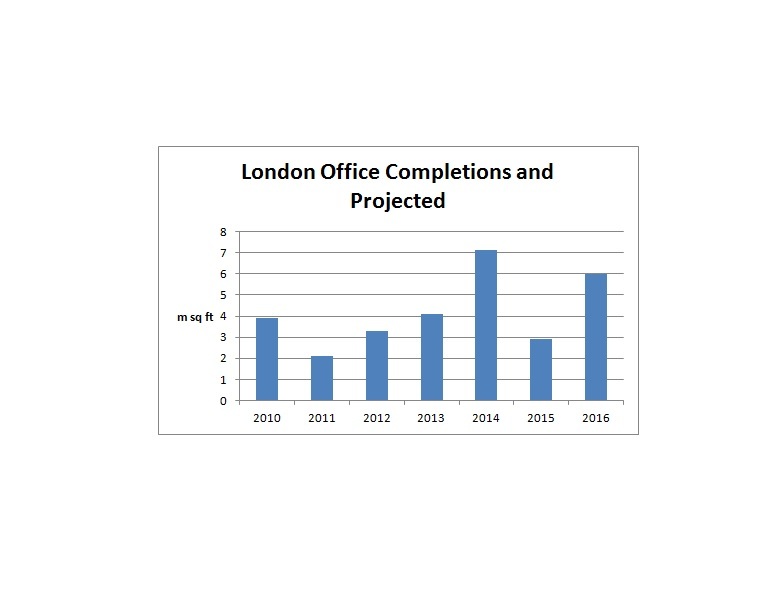 Recent research by Cityoffices and Metropolis found that the central London office development market has stepped up another gear over summer 2014, with a further 32 office schemes starting (or poised ready to start in Q4 2014) since March 2014. Contrary to reports of a moribund construction sector, a healthy total of nearly 3.5m sq ft office space went under construction over the last 6 months. Notable recent scheme starts included: London Wall Place, EC2 (500,000 sq ft); Angel Tower, EC2 (360,000 sq ft) , River Plate House, EC2 (160,000 sq ft); 25 Chancery Lane (100,000 sq ft); St James’s Market, SW1 (212,000 sq ft) and 48 Leicester Square, WC2 (92,000 sq ft). We expect nearly 15 further schemes to go under construction in the last quarter of the year. There is ‘only’ 8.7m sq ft of offices currently under construction (or about to start) following completion of over 4m sq ft in the previous two quarters, including nearly 2m sq ft in three buildings 20 Fenchurch Street, Leadenhall Building and 25 Churchill Place. This is below the 10m sq ft long term average of London space under construction, but does not take account of a further 5m sq ft currently at demolition stage. Some 25 schemes such as 100 Bishopsgate, 52 Lime Street and Principal Place are on the verge of starting and even The Pinnacle may join them. Looking ahead to 2015, there are currently only 31 schemes due for completion, delivering 2.8m sq ft, although this figure will rise slightly as a number of refurbishments will join the list. However in relative terms, there is a shortage of large speculative office schemes scheduled to open next year, to add to the 7m sq ft of completions in 2014. In 2016 a further 7-8 million is forecast for completion, with half of that already underway. Around 36% of office space under construction is already pre-let including recently-signed agreements with companies such as Amazon, KPMG and Estee Lauder. There is also a further raft of deals likely to be agreed in the near future which may include Societe Generale, Telefonica and Howden. Many schemes tend to find pre-lets closer to completion with over 50% of space completed during summer 2014 now pre-let. In contrast to some previous surveys, new-builds now make up the majority of new starts with 55% of the total compared to 45% refurbishments. However, with nearly 3m sq ft of deals under offer and many of the larger central London occupiers beginning to appoint agents to advise on pre-let opportunities the expectation is that a new wave of refurbishments is just around the corner. In conclusion, although a large amount of central London office space was completed over summer 2014 and although some recent press reports have chosen to spotlight the drop in space actually under construction, writers have failed to note that it is about to be replaced by almost as many schemes, if not the same volume of sq ft. In addition a large number of schemes are primed to start in 2015. The letting market continues to power on apace, exemplified by the recent pre-letting of the 400,000 sq ft Principal Place by Amazon and the rapid pre-letting of London Wall Place, EC2. Although 2015 looks likely to be a quiet year for completions, it will be balanced by up to 8m sq ft of completions in 2016.